The Best Pizza Spots in the U.S.
Top chefs and fabled bakers are among the new breed of pizzaiolo who are just as fanatic over the temperature of their ovens to how nearby their ingredients come from. They're elevating pizza around the country from greasy pies in cardboard boxes to inspired creations with crackly, charred crusts topped with house-made cheese and charcuterie. Here, we've chosen the 25 best places for pizza around the country from new guard spotsincluding a Bay Area pizzeria that uses locally-milled flourto the nearly-century old East Coast institutions started by the original pizzaiolo obsessives that loyalists still (rightfully) love. Signature Item: Popeye (with pecorino, Gruyère, mozzarella, spinach, black pepper and garlic). Sullivan Street Bakery founder Jim Lahey is one of the country's elite bakers, so it makes sense that people can't stop talking about his chewy, crisp, ever-so-slightly tangy pie crusts. Lahey's newest project: He developed the menu for Crust, a soon-to-open Neapolitan-style pie spot at LaGuardia Airport. co-pane.com. Pizza with zucchini. Photo © Robyn Lee. Signature Item: Tomato, homemade fresh mozzarella, Dante aged cheese, fresh herb. Detroit native Nick Lessins assembles pies to order and then masterfully chars them in his beloved gas oven. Some toppings are baked onto the ethereally crisp crust; otherslike the Mona cheese on the spinach pieare added when the pizza is just out of the oven. Signature Item: Homemade Sausage Pie. This super traditional pizzeria, with wood paneled walls covered with pictures of famous athletes, has been around for more than a century. santarpiospizza.com. Signature Item: Squash blossoms, tomato and burrata. Powerhouse team Mario Batali, Joseph Bastianichf and Nancy Silverton combine the best California ingredients (squash blossoms and trumpet mushrooms) with Italian tradition (big wood-burning ovens and house-made mozzarella) to form some of L.A.'s best pies. mozza-la.com. 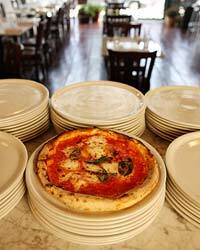 Signature Item: Margherita (with tomato sauce, Fior di Latte and extra-virgin olive oil). The puffy, charred cornicione (end crust) is the result of just two minutes in the 800-degree wood-burning oven imported from Italy. flourandwater.com. Photo courtesy of Al Forno Restaurant. Signature Item: Margarita (with house-made pomodoro, fresh herbs, two cheeses and extra virgin olive oil). In 1980, Johanne Killeen and George Germon launched a new era of ambitious cooking in Providence with their thin-crusted grilled pizzas topped with superfresh ingredients. alforno.com. 72-year-old owner Domenico DeMarco makes all the pies at this Brooklyn pizza mecca, so they come out with the perfect balance of tomato sauce (made fresh daily), mozzarella and Grana Padano cheeses. A Di Fara spin-off called Tagliare opened in LaGuardia Airport in the fall of 2010. difara.com. Photo © Doug Schneider Photography. Signature Item: White Clam pizza. This longstanding classic, considered ground zero for New Haven-style "apizza," was started by Frank Pepe in 1925, and is now run by his grandchildren. The Original Tomato Pie (without mozzarella) is still on the menu.pepespizzeria.com. Photo © John Sowell, Roseburg, Ore.
Signature Item: Apizza Amore (with tomato sauce, both fresh and aged mozzarella, pecorino, grana, olive oil, cured pork shoulder and fresh basil). Pizzaiolos Brian Spangler, Dan Roberts and Jon Ullrich are so exacting about their craft that they mix their dough by hand daily and won't let customers put any more than three toppings on the nicely charred pies. apizzascholls.com. Signature Item: Marinara pizza (star pizzaiolo Chris Bianco's favorite). The pizzas here are arguably America's best, with beautiful, wood-fired crusts made with organic flour, fresh mozzarella and house-made sausage. There's almost always a line out the door. pizzeriabianco.com. Slideshow: All Top Pizza Places in the U.S.